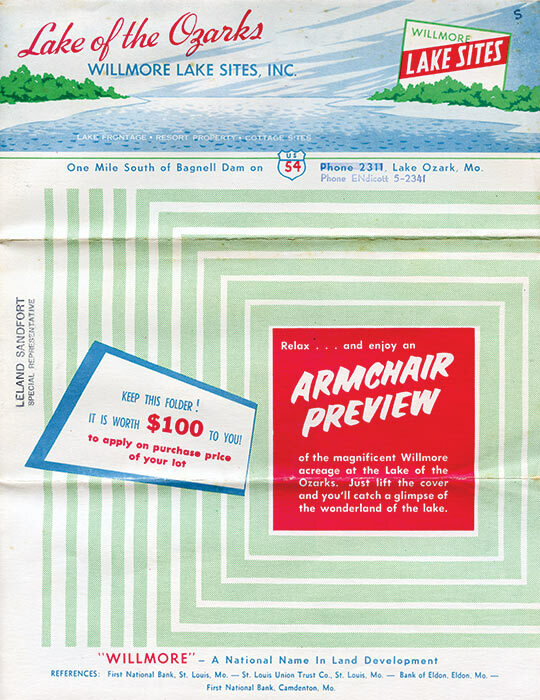 “Escape the pressure of the city for a life at the Lake!” proclaims this late 1940s or early 1950s real estate brochure. Interior copy promises a private domain to armchair shoppers reading and dreaming from their harried homes in the big city. 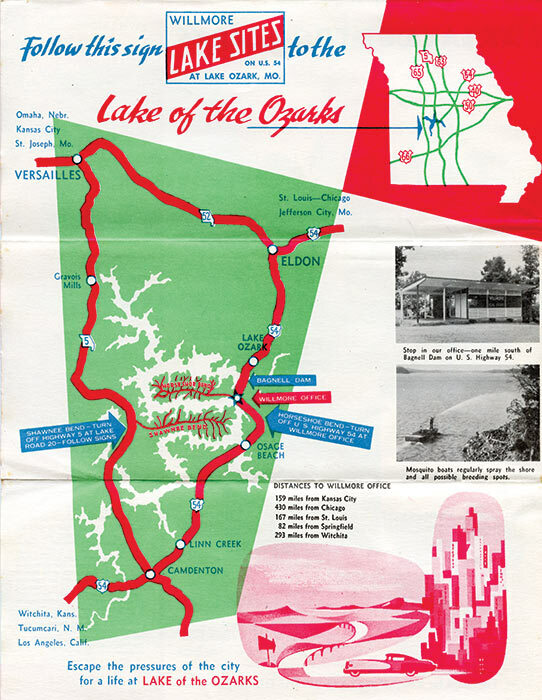 The magnificent 4500 acres of Shawnee Bend and the picturesque 5500 acre Horseshoe Bend are the finest acreage at the Lake of the Ozarks. The green hills are thick with oak, cedar and dogwood. Much of the land slopes gently to the shores of the lake … requiring little clearance and offering wonderful beaches. All sites have ample lake frontage with plenty of room for your own individual beach and dock space. This lake frontage belongs to the owner of the land. State approved water systems, electric power, and fine all-weather roads offer you all the conveniences of the city. Promises made back then are still controversial today. Recently Ameren and Lake homeowners disagreed on who owns the land to the water’s edge. We have a link to Willmore Lodge in our Resources menu.